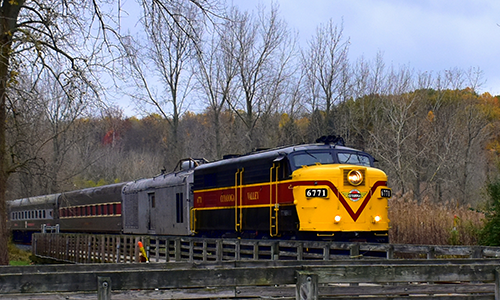 Peninsula, OH, January 10, 2019 – Starting January 19, Cuyahoga Valley Scenic Railroad (CVSR) will be running the National Park Scenic excursion on Saturdays and Sundays through April, as well as special event trains on Fridays. The government shutdown will not impact CVSR’s operations. In addition, new seating options will be available to passengers. The recently-acquired California Zephyr train cars, Silver Lariat and Silver Solarium, feature a comfortable lounge and a dome-observation car, perfect for viewing the winter scenery in Cuyahoga Valley National Park. Guests can now choose from a variety of cars to ride including: a newly-renovated dining car, first class lounge cars and private suites. From January through April, the National Park Scenic excursions will be two-and-a-half-hours long, roundtrip, which has been a frequent request from families with young children. CVSR will not run Day Out with Thomas™ this season due to the inability to hold the event at Boston Mills and other contributing factors. However, there will be several other popular family programs including: Royalty on the Rails, Superheroes on the Train, Read Aboard, Family Fun Loop, Steam in the Valley and THE POLAR EXPRESS™. The popular Bike Aboard program, which enables passengers to bike the trails and ride the train back for only $5 one way, will resume in May. In June, CVSR will run five days each week on Wednesdays through Sundays. Mazur said that CVSR looks to continue the Dinner on the Train excursion in June with the intention that it becomes a staple event like Ales on Rails™ and Grape Escape.